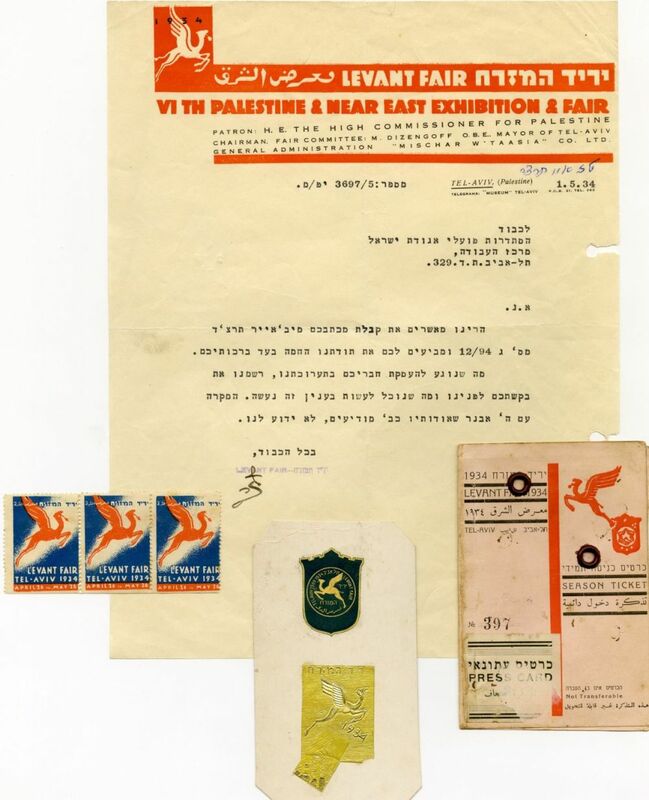 * "Permanent Admission Ticket" of a journalist named Lipman Luthnik, for the 1934 Levant Fair. There is a list of the rights of the bearer of the ticket on its reverse [discounts on train, boat and air services to the Land of Israel, open admission to the fair, hotel discounts, discounts for travel, restaurants, and the Mugrabi and Ophir cinemas for the duration of the fair]. * Three connected stamps which were published in honor of the 1934 Levant Fair with the emblem of the fair - the flying camel, and with "Levant Fair 1934" inscribed. * Two paper tags with the emblem of the fair - the flying camel, on one it faces right and on the second, left. * Letter on the fair's official stationery signed by Lazar in which he turns to the Histadrut Poalei Agudat Yisrael and expresses his appreciation and his desire to deepen the participation of its members in the fair. The Levant fair was an international trade fair which took place in Tel Aviv during the 1930s. The fair was preceded by a series of exhibitions and fairs held in Tel Aviv 1924-1929 and for the most part organized by the Trade and Industry company, which was established by Tel Aviv entrepreneurs. Various sizes and conditions, overall very fine condition.